I am so excited to share this resource with you. It is one of my favorite projects that we do all year in the third grade. We spend the entire month immersing our students in research of some of the greatest African-American leaders of all time. Our students make 3-dimensional portraits of their person, write a 5-paragraph essay including a direct quote from one of their sources, and engage in a variety of higher-ordered thinking activities that help them to assimilate their new knowledge. As a culminating activity, our students dress up like their African-American leaders and give a short speech from first-person point of view for other students, teachers, and their parents! It is such a blast! At this moment, I have been able to prepare the resources we use for the 5-paragraph research essay. 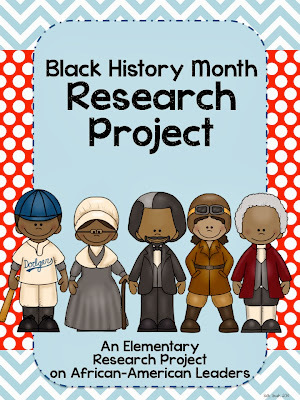 In the future, I hope to be able to add some of the craft activities into this resource, as well as comprehension reading passages for specific African American leaders in order to simplify the research process. If you purchase the product now, you will be able to lock in the low price, but will have all future additions available to you for no additional cost. Research projects can often be overwhelming because they cover such a variety of standards. It is my hope that this 32-page resource will help streamline the process for both you and your students so that it is both educational and enjoyable! I personally make a copy of this notes packet for each student. I include all pages, but I left off page numbers so that you can mix and match to best meet your students’ needs. These research-based strategies are designed to help students increase their overall comprehension of the topic they are studying. All graphic organizers are designed to help students assimilate what they have been learning about their African-American leader. Leader and Me: Students will use this graphic organizer to make a personal connection to their leader, looking for positive character traits that they may have in common. These planning pages help students align the research they collected in their Research Notes into proper paragraph format. It outlines which information is expected in each paragraph of the report. I do not require students to write their entire report at once. Rather, I break it into the specific paragraphs to focus on one at a time. This helps students not get overwhelmed. These 3 pages contain fill-in-the-bank portions for students that need help with sentence completion. It will provide great scaffolding for ESL, special needs, or other learners that need a little extra support.